Update: Rock was acquired by Cydia. Wanna Rock your iPhone? Rock is a new replacement jailbreak app installer for the iPhone and iPod touch to Cydia, Icy and Installer. It has a faster user interface, is filled with many features, and handles app installations a little quicker too. To get Rock on your iPhone or iPod touch, you gotta get your device jailbroken. You can do this using lots of various tools out there depending on what version of iPhone/iTouch you have and what OS/bootloader you have running on it. The most popular ones out there are blackra1n and Spirit. If you already have Cydia on your device, all you have to do is find Rock and install it from within Cydia itself. Rock has a complete developer backend as well where developers sign up for a Rock account so they can distribute and sell their apps through the Rock app. Rock is basically an fully integrated and independent iPhone App Store like system for the jailbroken community. Fast Startup: If you’ve used Installer and Cydia, you might be annoyed at how long they take every time you open them up. Rock loads up quick, no waiting around for stuff to update. User Reviews: You can read other reviews written and post new ones yourself. It’s like the real App Store (sort of) and helpful to see what others think especially before you buy new apps from 3rd parties in Rock. Quick Installs: Installing seems faster in Rock. You mostly don’t need to even respring your device after installs. Nice Category Layout: The category layout in Rock is pretty slick. You can manage and even hide show the categories you like or don’t want to see using an edit interface. The apps have icons and overall look friendlier (eg less geeky) than Cydia or Installer. You can sort the apps by Whats Hot, Whats New tabs similar to real AppStore. Rock uses something called a Rock ID which you sign up for. A RockID gives you the ability to buy and install apps. What’s pretty amazing is there is even a desktop app called “Rock Your Phone” which works like iTunes letting you sync your downloaded jailbroken apps. As always back up, and remember: once you jailbreak all bets are off as far as safety and stability. Also don’t forget to change the root password if you install SSH on your device. So, if you’re a jailbreaker be sure to definitely give Rock a try. If you’re not, then today’s ruling that the US government has legalized iPhone jailbreaking might ease your nerves enough to want to try it out. Use iPhone mods and hacks at your own risk! Installing 3rd Party iPhone apps requires you to jailbreak the iPhone before installing the native software and apps. 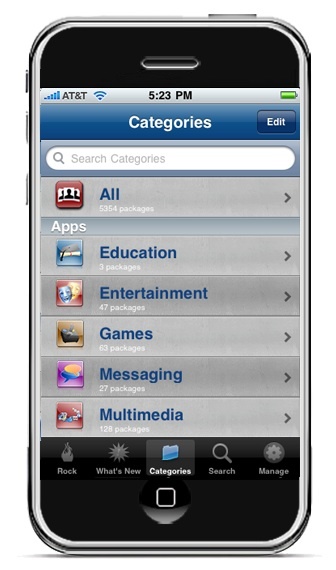 Browse the full list of all iPhone and iPod touch native 3rd party apps filed under the software category. 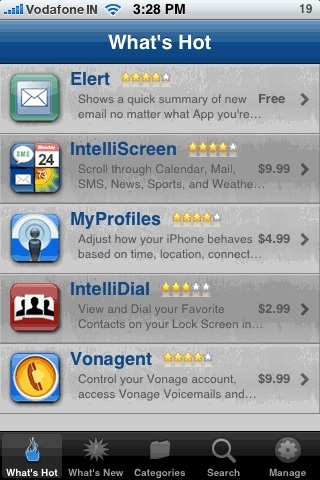 AppSafari review of Rock (your phone) was written by Joe Seifi on July 26th, 2010 and categorized under Cydia Apps, Featured, Utilities. Page viewed 12113 times, 3 so far today. Need help on using these apps? Please read the Help Page. I wondered if the bad update bricks the phone has been removed from the May 12 rock i install Cydia. I have an iPod Touch 2G jailbreak mc spirit of the model.